My daughter asked if she would be able to get her face on a coin just like the Queen, didn't think it was possible until I stumbled across Keepsake Coins on the Internet. Easy process you just email your picture you would like and message on coin, was so pleased with the end result and my daughter was so delighted once she saw her face on the coin so real looking. I would highly recommend the keepsake coins! I bought one as an anniversary present. Martyn and the team we’re very efficient at ensuring my design ideas looked perfect on the coin and I was very surprised at how quickly they were made and delivered! The coins as of such high quality and people are always asking about them! A great present idea! The process of ordering the coin, seeing the proof and then receiving the coin was all easier and quicker than expected. The great communication between myself and Martyn was a huge benefit, nothing was too much trouble. When the coin arrived, I could not stop looking at it! The detail that it shows, the quality of both the image and the text is incredible - even down to the stripes on a shirt! The gift when down a real treat and will be finding excuses to order another in the future. Really appreciate the hard work that was done, the coins I got made were for a gift my wedding. They look great and the communication was excellent, would recommend this for anyone wanting a different and unique gift. 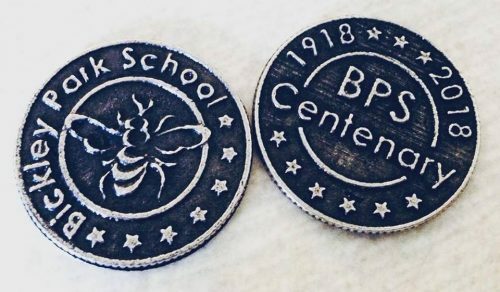 I found this amazing website whilst researching for a company to make 400 centenary coins for my school. I had a vague idea of what we wanted but Martyn was extremely helpful with the final design of the coin. The price was also considerably cheaper than other quotes I had received. Martyn designed and sent a prototype of the coin at a very competitive price for us to see the what the finished article would look like. I was very happy with the final design, finish and size of the coin and the price of presentation wallets/bags was also extremely competitive. This company’s customer service is A1 and Martyn was very patient with my many many emails regarding my order. I have no hesitation in recommending Keepsake Coins. Martyn created the most stunning coins for a publicity campaign of a hot new release by a high profile author. From the moment we got in touch with Martyn, we were impressed by his enthusiasm and professionalism, offering considered and creative suggestions to help make our project a success. Martyn made the coins to a tight deadline and we are extremely happy with the quality of the coins he created and would definitely recommend.